July and August are peak season for fresh peaches. Choose peaches that are firm to the touch, but whose flesh will yield with gentle pressure. The fruits should be unblemished and free of bruises, with a warm, fragrant aroma. Most peaches will have a rosy blush to the skin, but this is usually just a variety trait and not necessarily an indication of quality. A good indicator of maturity is a well-defined cleft in the shape of the peach. Avoid those with any hint of green as they will never fully ripen. Although peaches will continue to ripen after being picked from the tree, the sugar production ceases once plucked and will not increase even though the fruit may soften. Under-ripe peaches can be ripened somewhat by placing them in a paper bag punched with holes at room temperature in a spot away from sunlight. Check often for ripeness as they can go from underripe to overripe in a matter of twenty-four hours. An apple or banana, both of which exude natural ethylene gas, added to the bag will hasten ripening. To remove the seed, slice lengthwise 360 degrees around the pit down to the stone. Twist each half simultaneously in opposite directions. Freestone peaches should separate easily. 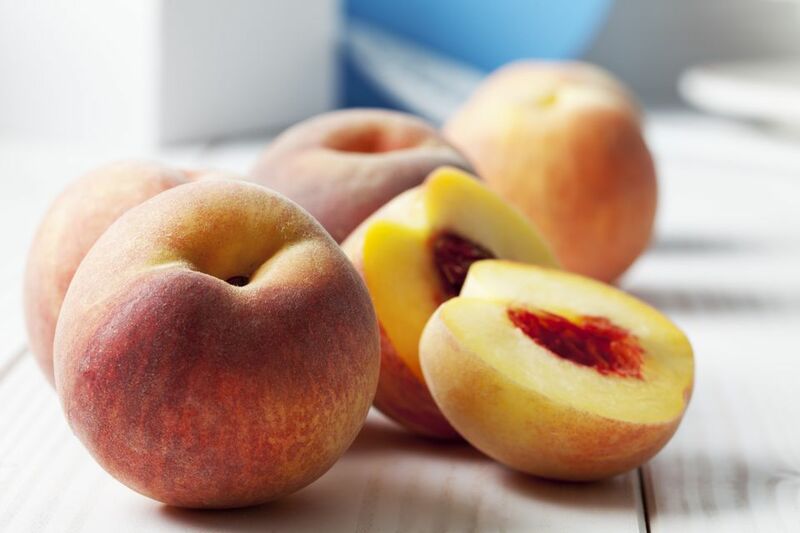 Since peaches are highly perishable, purchase only the amount you need to use within a few days or plan on preserving them for long-term storage. The fruit should not be washed until just before you intend to use it. When storing fresh peaches at room temperature, be sure there is enough space between them to allow proper air circulation. Fresh peaches can be kept at room temperature three to four days, depending on how ripe they are when you buy them. Refrigeration will extend their life, but not by more than a day or two. Peaches need humidity, so refrigerate in a plastic bag and use within two days. Ideally, let refrigerated peaches come close to room temperature before eating (about 30 minutes), as the flavor will be ​more full and robust. The seed stone will impart a bitter flavor, so be sure to remove it before canning or freezing peaches. Peaches frozen in a sugar pack result in a better product than those frozen in plain water. Better quality is also served if you peel raw peaches rather than blanching before freezing. If the fruits are overly ripe, puree or chop the fruit, add an acidic juice to keep the fruit from darkening, and freeze in a tightly sealed container or plastic zip-top bag with air removed. Peach puree can be dried into fruit leather. Slices and halves can also be dried or dehydrated. Commercially-canned peaches can be stored in a cool cupboard unopened for up to one year. Opened canned peaches should be refrigerated and used within one week.